Have you ever wondered if our furry friends can dream like us? Have your pets ever woken you up either moving all around the bed or making various sounds (it’s definitely safe to sleep with your pet)? These can lead us to believe that our pets are in fact dreaming. Even though our adorable pets can’t tell us if they dream themselves, we can find out through science if and how animals dream. Scientists believe that it’s not unlikely our dogs and cats dream since even animals with far less developed brains can. The human and mammal brain also have quite a similar structure. We humans encounter dreaming in the rapid eye movement (REM) sleeping phase. 90 minutes after we fall asleep, we enter REM sleep where our brain activity is comparable to that of when we’re awake. However, our limbs are paralyzed because our pons (the communication center of our brains) prevents our brain from sending signals that allow us to move. This stops us from physically acting out the events in our dreams. This sleep phase isn’t exclusive to only humans. In general, most mammals can fall into REM sleep. This causes us to believe that our furry friends have the capacity to dream. But for our pets, they reach REM sleep quicker than us. Within a 20 minute span, our canine and feline friends’ dream adventures are ready to start. If you want to see your pets dream, a sign they’ve reached REM sleep is a noticeable change in breathing pattern which is now more rapid. What do they dream about? REM sleep is also associated with storing memories and learning. This is why some of our dreams have connections to what happened during the day. A study conducted in 2001 by Michael Wilson and Kenway Louie of the Massachusetts Institute of Technology compared the brain activity of awake and asleep rats. During the day, the rats’ brain activity were recorded while they journeyed inside of a maze. At night, when the rats reached their REM sleep, the same level of activity was present in the brain. Specifically, in the hippocampus which is a part of the brain linked to memory storage. It was so similar to the point the scientists were able to identify where in the maze the rodents were in their dreams. The two MIT scientists concluded the rats were recalling their memories in their dreams, similar to us humans. In another study conducted by Michel Jouvet and his team in 1959, cats’ brains were altered to allow movement while they were sleeping. The neuroscientists discovered once REM sleep was reached, they moved as if they were seeing real-time images. Their movements mimicked actions they do whilst awake. This includes catching prey and moving their heads, despite their brain patterns proving that they were in fact asleep. It seems we have more in common with our lovable friends than we thought. Not only do we all encounter REM sleep, but also recall memories of our day in our sleep as a result of storing them for the long-term. 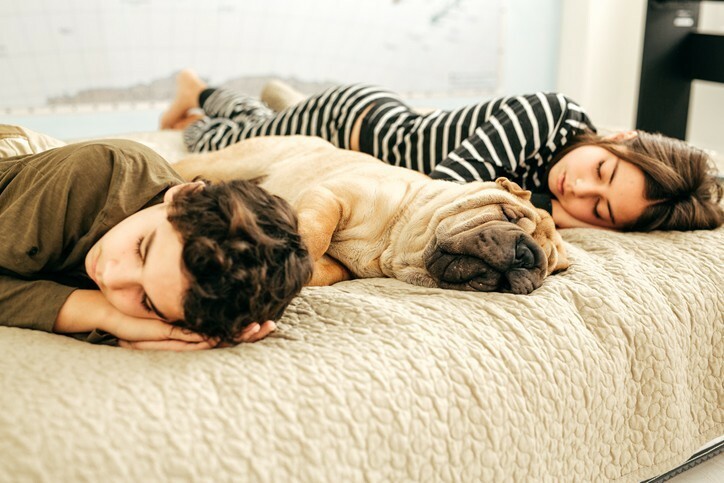 If sleeping with your dreaming pets interferes with your sleep rhythm, you could consider investing in a mattress made to absorb motion. Then, you and your pet can embark on wonderful dream adventures together!